Young investors Charlie Geller and Jamie Shipley accidentally discover a prospectus by Vennett, convincing them to invest in swaps, as it fits their strategy of buying cheap insurance with big potential payouts. Below the capital threshold for an ISDA Master Agreement required to enter into trades like Burry's and Baum's, they enlist the aid of retired securities trader Ben Rickert. When the bond values and CDOs rise despite defaults, Geller suspects the banks of committing fraud. The trio also visit the Forum, learning that the U.S. Securities and Exchange Commission has no regulations to monitor mortgage-backed security activity. They successfully make even more profit than other hedge funds by shorting the higher-rated AA mortgage securities, as they were considered highly stable and carried a much higher payout ratio. Geller and Shipley are initially ecstatic, but Rickert is disgusted, citing the impending collapse and its effects; when unemployment goes up 1%, 40,000 people will die. Furthermore, they realize the banks and the ratings agency are maintaining the value of their CDOs in order to sell and short them before the inevitable crash. Horrified, they try to tip off the press and their families about the upcoming disaster and the rampant fraud but nobody believes them. As the market starts collapsing, Ben, on vacation in England, sells their swaps. Ultimately, they make a profit of $80 million, with their faith in the system broken. Jared Vennett makes $47 million in commissions selling off the swaps. Mark Baum becomes more gracious from the financial fallout, and his staff continues to operate their fund. Charlie Geller and Jamie Shipley go their separate ways after unsuccessfully trying to sue the ratings agencies, with Charlie moving to Charlotte to start a family, and Jamie still running the fund. Ben Rickert returns to his peaceful retirement. Michael Burry closes his fund after public backlash and multiple IRS audits, now only investing in water securities. The banks responsible for the crisis escape any consequences for their actions. It is noted that as of 2015, banks are selling CDOs again under a new label: "Bespoke Tranche Opportunity". Christian Bale as Michael Burry - one of the first people to discover the American housing market bubble. Burry operates his own hedge fund, Scion Capital, and uses his liquidity to short the housing market. Steve Carell as Mark Baum - the leader of FrontPoint Partners, a small independent trading firm. Baum is in a state of constant disgust with the American banks. Ryan Gosling as Jared Vennett - a salesman from Deutsche Bank who decides to sell Burry's credit default swaps for his own profit. Brad Pitt as Ben Rickert - a retired former trader who helps Jamie and Charlie with their trades. Melissa Leo as Georgia Hale - a blind employee of Standard and Poor's. Hamish Linklater as Porter Collins - one of Baum's team. John Magaro as Charlie Geller - one half of Brownfield Fund, who discover Vennett's prospectus and also decide to short the housing market. Rafe Spall as Danny Moses - one of Baum's team. Jeremy Strong as Vinny Daniel - one of Baum's team. Finn Wittrock as Jamie Shipley - one half of Brownfield Fund, who discover Vennett's prospectus and also decide to short the housing market. Marisa Tomei as Cynthia Baum - Mark Baum's wife. Tracy Letts as Lawrence Fields - a banker who oversees Burry's hedge fund. Jeffry Griffin as Chris - Jared Vennett's assistant. Byron Mann as Mr. Chau - an immoral CDO specialist who Baum interviews in Las Vegas. Adepero Oduye as Kathy Tao - an employee of Morgan Stanley, who oversees Baum's fund. Karen Gillan as Evie - an employee of the SEC who quits her job to try and work for the banks. Max Greenfield as Mortgage Broker - an immoral Florida broker who targets strippers. Billy Magnussen as Mortgage Broker - an immoral Florida broker who targets immigrants. Principal photography on the film began on March 18, 2015 in New Orleans, Louisiana. On March 25, filming was taking place on General De Gaulle Boulevard in the Algiers section of New Orleans. On May 8, Gillan confirmed she was shooting her scenes. On May 20, 2015, filming took place on a short stretch of Mercer Street, between Prince Street and Spring Street, in Manhattan, New York City. On May 22, the production crew recreated the offices of failed investment firm Lehman Brothers in the lobby of the New York State Department of Financial Services in Manhattan. An assistant counsel for the Department of Financial Services played one of the extras in the scene. The Big Short grossed $70.3 million in the United States and Canada and $63.2 million in other countries for a worldwide total of $133.4 million, against a production budget of $50 million. On Rotten Tomatoes, the film has an approval rating of 88% based on 306 reviews, with an average rating of 7.7/10. The site's critical consensus reads, "The Big Short approaches a serious, complicated subject with an impressive attention to detail – and manages to deliver a well-acted, scathingly funny indictment of its real-life villains in the bargain." On Metacritic, the film has a score of 81 out of 100, based on 45 critics, indicating "universal acclaim". Audiences polled by CinemaScore gave the film an average grade of "A–" on an A+ to F scale. IGN gave the film a score of 8.6/10, praising its "energetic direction" and making "a complicated tale palpable for the layperson even as it triggers outrage at the fatcats who helped cause it". The New York Times' "UpShot" series stated The Big Short offered the "strongest film explanation of the global financial crisis". The series also stated that it "wouldn't necessarily have been able to cash in as successfully as the characters in The Big Short. The success of this film is due to the work of the actors who played the characters. Movie critics with backgrounds in finance also commented on the film. Many agreed with the public that The Big Short was entertaining and engaging, but also terrifying. Glenn Kenny reported that the film accurately got the message across even though the lives of the characters were not interconnected, their stories were. Steve Eisman, who is portrayed as Mark Baum in the film, said that he respects Carell's portrayal but that it was not 100 percent true to his real character. Eisman told The Globe and Mail that he felt his character was too funny. Instead of having a sense of humor, he felt that his character should have been angry all of the time. Adam McKay and Charles Randolph won the Academy Award, BAFTA Award, and Writers Guild of America Award for Best Adapted Screenplay. They also won an Empire Award for the Best Screenplay. Christian Bale won the Critics' Choice Movie Award for Best Actor in a Comedy and the Satellite Award for Best Supporting Actor (Motion Picture). Hank Corwin won the American Cinema Editors Award for Best Edited Feature Film (Comedy or Musical) and Los Angeles Film Critics Association Award for Best Editing. The film earned the Critics' Choice Movie Award for Best Comedy and was named one of the Top 10 Films of the Year at the American Film Institute Awards 2015. Dede Gardner, Jeremy Kleiner, and Brad Pitt won the Producers Guild of America Award for Best Theatrical Motion Picture. The cast also won the National Board of Review Award for Best Ensemble. ^ "THE BIG SHORT (15)". British Board of Film Classification. November 9, 2015. Retrieved November 9, 2015. ^ FilmL.A. (June 15, 2016). "2015 Feature Film Study". Archived from the original on July 4, 2016. Retrieved June 29, 2017. ^ a b "The Big Short (2015) - Box Office Mojo". Box Office Mojo. Retrieved May 22, 2017. ^ a b c "Paramount Taps 'Anchorman' Helmer Adam McKay To Adapt And Direct Michael Lewis' 'The Big Short' About Economic Meltdown". Deadline Hollywood. March 24, 2014. Retrieved April 18, 2015. ^ Finely, Dash (December 16, 2015). "The Big Secrets Of The Big Short: How Unexpected Cameos Impact The Year's Must-See Film". MoviePilot.com. Archived from the original on April 28, 2016. Retrieved December 27, 2015. ^ "Paramount pushes 'The Big Short' into awards season". Associated Press. September 25, 2015. 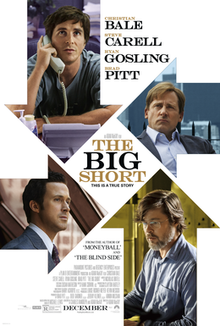 ^ "The Big Short | Trailer & Movie Site | December 2015". The Big Short. Retrieved 2015-12-26. ^ a b Kit, Borys (January 14, 2015). "Steve Carell in Talks to Join Christian Bale, Ryan Gosling in 'The Big Short'". The Hollywood Reporter. Retrieved January 15, 2015. ^ Truffaut-Wong, Olivia. "These 'Big Short' Quotes Are Unforgettable". Bustle. Retrieved 2019-03-19. ^ McNary, Dave (March 24, 2014). "'Anchorman's' Adam McKay Boards Financial Drama". variety.com. Retrieved April 18, 2015. ^ a b Hogan, Brianne (January 20, 2016). "Banking on The Big Short". Creative Screenwriting. Retrieved January 21, 2016. ^ a b Justin Kroll (January 13, 2015). "Brad Pitt, Christian Bale and Ryan Gosling to Star in Financial Drama 'The Big Short' (EXCLUSIVE)". Variety. Retrieved January 14, 2015. ^ a b Fleming Jr, Mike (April 21, 2015). "'The Big Short' Solidifies With Christian Bale, Steve Carell, Ryan Gosling, Brad Pitt". Deadline Hollywood. Retrieved May 21, 2015. ^ "Max Greenfield Joins Brad Pitt, Ryan Gosling in 'The Big Short' (EXCLUSIVE)". Variety. April 23, 2015. Retrieved April 23, 2015. ^ a b "Karen Gillan on Twitter". Twitter. Retrieved May 21, 2015. ^ "Brad Pitt, Ryan Gosling, & Christian Bale are headed to Orleans for 'The Big Short'". onlocationvacations.com. February 10, 2015. Retrieved February 13, 2015. ^ "'The Big Short', starring Brad Pitt, Ryan Gosling, & Christian Bale, begins filming in New Orleans". onlocationvacations.com. March 23, 2015. Retrieved March 29, 2015. ^ "'The Big Short', starring Brad Pitt Ryan Gosling & Christian Bale, filming in Algiers, LA today". onlocationvacations.com. March 25, 2015. Retrieved March 29, 2015. ^ "'The Big Short', starring Brad Pitt and Ryan Gosling, is filming in NYC this week!". onlocationvacations.com. May 16, 2015. Retrieved May 22, 2015. ^ a b Matthews, Christopher M. (22 May 2015). "'Big Short' Recreates Lehman Bros. Offices in Regulator's Building". The Wall Street Journal. Retrieved 25 May 2015. ^ "Paramount pushes 'The Big Short' into awards season". CNS News. Archived from the original on January 26, 2016. ^ "The Big Short Website". Paramount Pictures. ^ Pamela McClintock (December 13, 2015). "Box Office: Ron Howard's 'Heart of the Sea' Capsizes With $11M U.S. Debut". The Hollywood Reporter. Retrieved December 13, 2015. ^ Scott Mendelson (December 13, 2015). "Box Office: 'In The Heart Of The Sea' Is A Whale Of A Fail, 'Big Short' Strikes It Rich". Forbes. Retrieved December 13, 2015. ^ a b "'Daddy', 'Joy' & 'Hateful Eight' Reap Fortune As 'Star Wars' Halo Effect Impacts B.O…Can 'Force Awakens' Hit $1 Billion In U.S.?". Deadline Hollywood. ^ "The Big Short reviews". Rotten Tomatoes. Retrieved January 14, 2019. ^ "The Big Short Review – IGN". IGN. Retrieved 2015-12-26. ^ Irwin, Neil (December 23, 2015). "What 'The Big Short' Gets Right, and Wrong, About the Housing Bubble". New York Times. Retrieved December 27, 2015. ^ Kenny, Glenn. "The Big Short Movie Review & Film Summary (2015) | Roger Ebert". www.rogerebert.com. Retrieved 2017-12-21. ^ "Invest like a legend: Steve Eisman". Retrieved 2017-12-21. ^ "Oscars 2016: Winners list in full". BBC News. February 28, 2016. Retrieved January 22, 2018. ^ "Bafta Film Awards 2016: Winners". BBC News. February 14, 2016. Retrieved January 22, 2018. ^ "Previous Nominees & Winners: 2016 Nominees & Winners". The Writers Guild Awards. Retrieved January 22, 2018. ^ Nugent, John. "Jameson Empire Awards 2016: Star Wars and Mad Max lead the nominations". Empire. Retrieved January 22, 2018. ^ a b Rosen, Christopher (January 17, 2016). "Critics' Choice Awards 2016 winners: Spotlight, Mad Max, Leonardo DiCaprio, and more". Entertainment Weekly. Retrieved January 22, 2018. ^ "2015". Satellite Awards. Retrieved January 22, 2018. ^ Adam Chitwood (January 4, 2016). "Mad Max: Fury Road, Star Wars, The Big Short Land ACE Eddie Editing Nominations". Collider. Retrieved January 13, 2015. ^ "Spotlight wins top prize from the Los Angeles Film Critics Association". Entertainment Weekly. December 6, 2015. Retrieved January 22, 2018. ^ Hammond, Pete; Andreeva, Nellie (December 16, 2015). "AFI Awards: Disney & Majors Dominate Film; Rookies Shine On TV Side". Deadline Hollywood. Retrieved January 22, 2018. ^ "Nominees Announced For Theatrical Motion Picture, Animated Motion Picture, And Long–Form TV". Producers Guild of America. Retrieved January 22, 2018. ^ Lewis, Hilary (December 1, 2015). "'Mad Max: Fury Road' Named Best Film by National Board of Review". The Hollywood Reporter. Retrieved January 22, 2018. This page was last edited on 14 April 2019, at 07:32 (UTC).